Road Transport and Bridges Minister Obaidul Quader on Thursday said Yoga can help recover from drug addiction as narcotics have flooded the country. The minister made the remarks while addressing the International Yoga Day celebrations as the chief guest at Bangabandhu National Stadium in the morning. Indian High Commission in Dhaka organised the Yoga Day celebrations to observe the International Yoga Day for the fourth consecutive year. International Day of Yoga is celebrated across the world on 21 June since its inception in 2015. An international day for yoga was declared unanimously by the United Nations General Assembly (UNGA) on 11 December 2014. Obaidul Quader said yoga contributes to good health and sound mind, remove tension, malignance and other mental stresses. Indian Prime Minister Narendra Modi has reestablished yoga in modern forms and it’s now very popular in Bangladesh too, he said. Biren Sikder, state minister for youth & sports attended the function as a guest of honour. Arif Khan Joy, deputy minister for youth & sports was also present on the occasion. Indian High Commissioner Harsh Vardhan Shringla delivered the welcome remarks at the function. Biren Sikder said yoga is the creation of the people of the Indian subcontinent and it has no side effects. Yoga has been gaining popularity all around the world over the years, he noted. Shringla said June 21 is the longest day on the year and International Yoga Day is being celebrated around the world on this very day. “We are celebrating the occasion in Bangladesh since 2015 and the number of audiences has been increasing every year,” he added. Indian Prime Minister Modi celebrated the day in Dehradun where Bangladeshi freedom fighters took training in 1971, he noted. 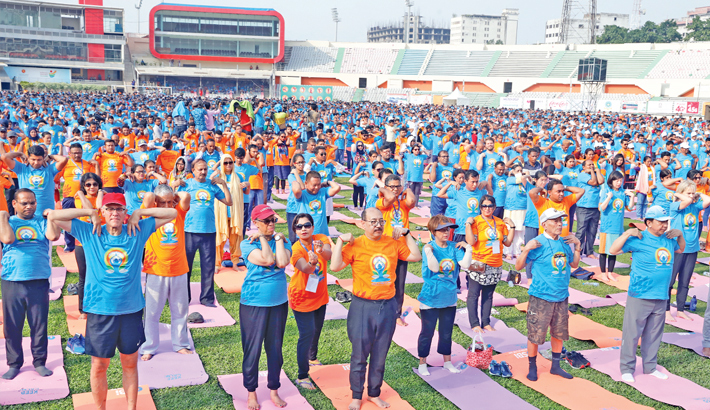 On the occasion, Dhaka went yogic for several hours on Thursday as the capital was abuzz with a large number of yogis from across the country to celebrate the International Yoga Day. Dhakaites woke up to the footfalls of yogis who broke the morning silence while walking to the Bangabandhu National Stadium to take part in the celebrations. The stadium neighbourhood wore a festive look as around 10,000 yogis in blue t-shirts simultaneously practised yoga in the morning. The presence of many cultural celebrities and well-known sportspersons of Bangladesh at the event generated enthusiasm amongst the yogis. The haunting performances of different yoga teams also held the audience spellbound during the event. President of Bangladesh Md Abdul Hamid sent a message on the occasion. Mumpy Dey, teacher of Indian Culture at Indira Gandhi Cultural Centre (IGCC), conducted the Common Yoga Protocol. Demonstration of yoga asanas was also performed by yoga students of IGCC and other yoga institutes in Dhaka. Sports associations, Yoga associations, Yoga Institutes, students from various schools, colleges and universities from across Bangladesh participated in the early-morning programme. Marking the day with grandeur, similar events were also organised by the Assistant High Commissions of India in Rajshahi and Chittagong. The idea of international Day of Yoga was the first proposed by the Prime Minister of India, Narendra Modi during his speech at the UNGA, on 27 September 2014. Indian Prime Minister in his UN address suggested the date of 21 June, as it is the longest day of the year in the Northern Hemisphere and shares special significance in many parts of the world.